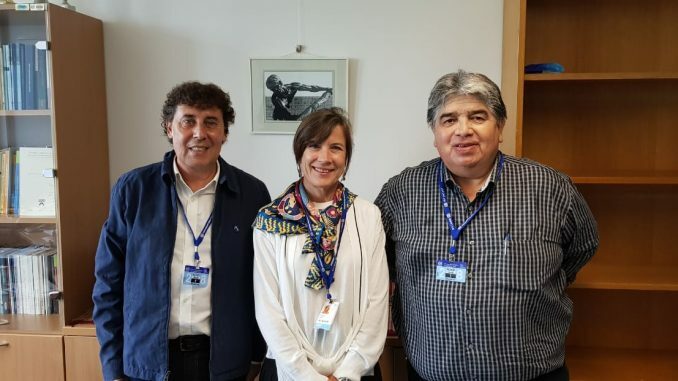 As part of the 107 Annual Assembly of the International Labor Organization (ILO) which took place in Geneva, both Pablo Micheli, General Secretary of the CTA Autónoma (CTAA) and José Rigane Deputy Secretary of the CTAA, met with Karen Curtis, Chief of the Freedom of Association Branch of ILO’s International Labour Standards Department, and Jordi Agusti-Panadera, Coordinator of Freedom of Association, with the aim of raising different cases and problems that Argentina is going through in terms of freedom and union democracy. Both leaders emphasized the policy of union persecution carried out by the current Argentine government through the intervention of trade unions, repression of social protests and media stigmatization, in order to intimidate trade union organizations, create a climate of fear among comrades and thus move forward with austerity policies, including job insecurity and precarization of employment. In this sense, Micheli and Rigane raised concern about the case of Horacio Catena, Secretary General of the CTA-A Tierra del Fuego and of the SUTEF, who was removed by Governor Rosana Bertone, as well as the Deputy Secretary General of the Luz y Fuerza Zárate union, Damián Straschenco, who was poisoned in his place of work. Additionally, the need was transmitted for the Trade Union Freedom Commission to act before the Argentine government so that it grants the union status to the FeTERA as it was resolved by the General Chamber of Labor. The Ministry of Labor has not issued the required number for more than a month, which is why the intervention of the Director General of the ILO, Guy Ryder, was requested, and the international entity committed to intercede quickly. Finally, the lack of possibility to discuss the collective bargaining agreement of the judicial employees was highlighted, which adds another aspect to what the lack of union freedom and democracy means.